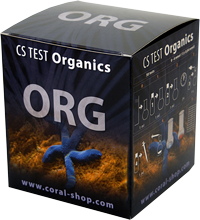 Test is intended for the determination of dissolved organic matter (DOM) in seawater, as well as freshwater. It is based on the reaction of sample with strong oxidizing agent, reacting not only with DOM but in less extent also with POM (Particulate Organic Matter) and some trace elements. Thus, formally we are talking about the test kit for determination of reducing matter in aqueous solutions. 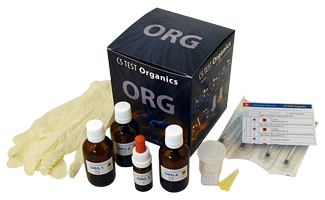 The results are expressed as the consumption of oxidizing agent in millimols per 1 litre of tested water. Since the test kit is intended for general reefkeeping public, it was necessary to avoid the use of any concentrated acids and aggressive catalysers in test agents as well as a need of sample solution heating before titration. Because the oxidation of high-molecular organic compounds is relatively slow process, the only chance was to extend the reaction time of oxidizing agent with the sample without the access of air – in case of CS TEST Organics on 24 hours in closed titration flask or titration container respectively. 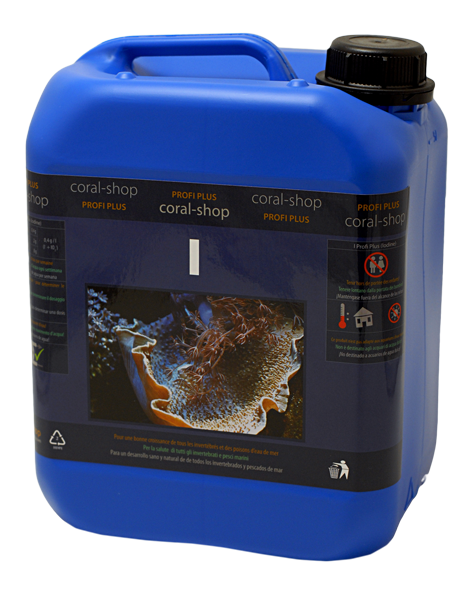 If test results are not above limit and yet the algae and cyanos grow in the tank, the problem is most probably in high concentration of inorganic nutrients – trace elements for instance. Used for determination of active carbon quality or its proper way of application (amount, time), perhaps even for the comparison of various brands. Start the 1st test just before the application of carbon, the 2nd one ca. 4 hours after. However the DOM has to be present in water in measurable concentration before the 1st test – otherwise any probing makes no sense. With certain limitations CS TEST Organics is also usable when checking the efficiency or settings of skimmers. Skimming removes from water not only DOM, but also POM (particulate organic matter), which is however detectable by the test only partially. Nevertheless, the results of testing – treated as a good estimation – are well usable in practice. Start the 1st test just before the change of settings or exchange of skimmer, the 2nd one ca. 15 – 20 hours after. As in the previous case, the DOM has to be present in water in measurable concentration before the 1st test.